A lot of those shades make sense, lol.. I donate to a thrift shop here in Houston that's based out of Missouri and they get a LOT of stuff from the St. Louis area, I've noticed that a lot of the Rams jersies they get in (older ones from before the NFL's deal with Reebok) and you'd be surprised how many of them are actually different colors. I've seen a lot that were made by Nike or Champion that used a really dark color of gold and blue. The Rams have apparently rolled out some new Nike T-shirts. These shirts were spotted in Santa Monica by NFL Network’s Andrew Siciliano. We know it’s Nike gear because if you look closely, one sleeve has a yellow Nike logo while the other sleeve has the classic Rams helmet. Every indication seems to point that the Rams will be getting rid of their millennium blue and new century gold in favor of the classic bright yellow and bright blue. 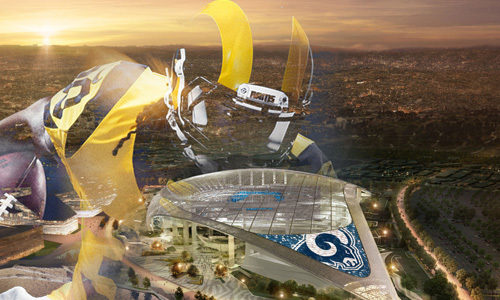 From the photo above to the Rams selecting 2015 highlights of the team wearing the classic uniforms in their “Coming Home” montage. We here at Rams Wire already made our case for the Rams to bring back the classic uniforms. If you spot any other kind of Rams gear throughout the Los Angeles area be sure to tag us on Twitter @TheRamsWire or@MelendezSports, and also tag us on Facebook. We’ll be sure to share your photos. OH boy! LETS GET PUMPED GUYS! We've been waiting all season for this! And, the Rams will be wearing all white uniforms today! Are the rams going to use their throwbacks this year? If so, what games? Rams want old school uniforms now - NFL says "no"
Since the Rams moved back to Los Angeles, questions have raged about which uniforms they should wear: The blue and white of Merlin Olsen in the 1960s? The blue and yellow of Eric Dickerson in the 1980s? The blue and gold of the St. Louis years? Some combination? The Rams are working on a permanent answer, but in the meantime they’d like to wear the Dickerson-style throwbacks more. The NFL, however, has other ideas. Rams COO Kevin Demoff says the team has asked the NFL for permission to wear the blue and yellow throwbacks more often, but the NFL limited the Rams to wearing them twice last season. Demoff said he’s working on explaining to the league office that the fans would prefer those uniforms. Demoff said the Navy blue jerseys the Rams have worn aren’t anyone’s favorite.